Capture, Edit, Stream and Burn! Do you have hours of video that you would like to share with your friends and family? How about a presentation that could benefit from the power that multimedia integration allows? All you need is a PC and Broadway Pro DVD. 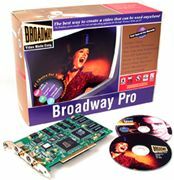 We will send you the Broadway Capture Card (PCI), Broadway Capture Software, and a professional quality video editing package that can allow you to create almost anything you can think of. Broadway allows users to share and broadcast special moments, lectures, presentations, distance learning at any time, any place. Broadway does it all. Grab footage from any source: VCR, camcorder, or stock video library. Then cut, paste, edit sound, add fades, and more. Broadway makes video editing one of the easiest things you'll do at your desktop. When you're done, compress to MPEG, or a streaming format, or output to videotape, Video CD/CD-ROMs or DVD. There's no simpler, more affordable way to get high-quality video into your everyday applications. MPEG stands for the best choice for the Web, CD-ROM, and other channels with limited bandwidth. Broadway's MPEG-1 compression reduces video file sizes by up to 200:1 to conserve precious disk space. At the same time, you get stunning video quality and CD-quality audio. And streaming too. Broadway supports RealNetworks Internet streaming format that allows you to play back video in real time over the Web.